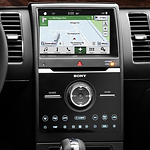 If the Ford Flex has caught your interest, it comes with with advanced features that offer many benefits. Our associates at Northside Ford Lincoln always research our vehicles to keep our consumers informed about our vehicles. Let's find out what technology features are available with the Flex. The Flex comes with ergonomic instruments and controls that enhance driver comfort. The controls and instruments are easy to read during the day or night and are strategically placed in the cabin so that they can be easily reached. The Flex offers comfortable seating that accommodates up to seven passengers. With the Flex, you get first-row bucket seats, a second-row bench seat, and a third-row bench seat. You can opt for the second-row buckets seats with pass-through that can be easily folded down so that third-row passengers have easy access to their seats. The available PowerFold third-row seat can be folded flat for additional cargo space.